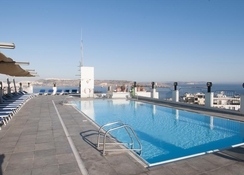 Hotel Santana Malta enjoys a fabulous location in the Qawra peninsula. In Qawra, you will find numerous shops, bars, restaurants, supermarkets, casinos and cinema theaters. This magnificent resort is easily accessible from all corners of the island by road and rail. The bus terminus that is a mere two-minute walk away from the hotel. The rooms are available in numerous categories to suit the budgets and requirements of the modern traveller. The best and the foremost aspect of the hotel is the Indigo wellness centre, where you can relax and avail a beauty treatment or massage. 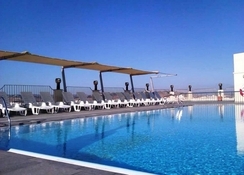 Dive into the lovely outdoor swimmwswimming pooling pool that is set on the rooftop, where you can also enjoy magnificent views of the sun, sand and the city. 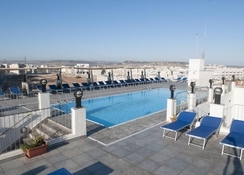 Hotel Santana Malta is conveniently situated in Qawra, Malta. 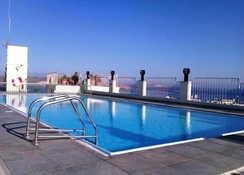 It is just a short drive away from cities such as Sliema, St Julian’s and Valletta. 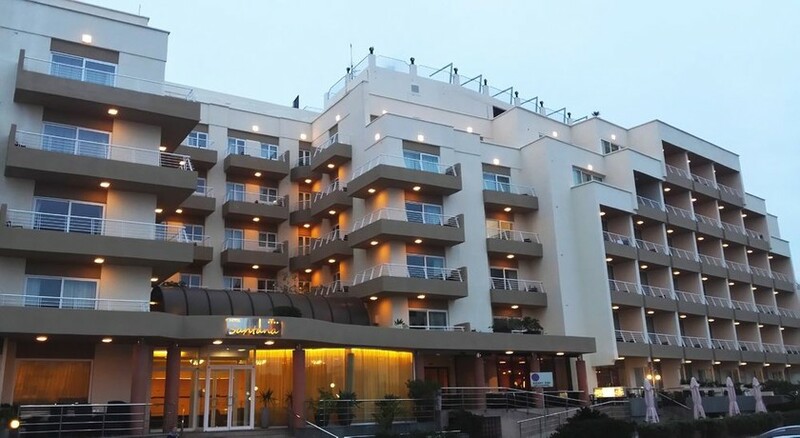 For endless nightly entertainment head over to the St. Julians resort, it is only 11km from the hotel. The Malta International Airport is about 18.1km from the hotel, making it convenient for guests to board their flights on time. The rooms in the hotel are absolutely stunning offering spectacular views. They are categorised as economy rooms, standard rooms, comfort rooms, family rooms, suites and executive suites. All the rooms come with the amenities including balcony, free Wi-Fi, safe, tea & coffee making facilities, centralized heating, centralized air conditioning, ceiling fan, en suite shower, satellite TV, mini-fridge, radio, hair dryer, continental socket, in-room hair dressing services, iron and ironing board available on request and much more. The hotel features an exceptional onsite restaurant, a café and a pool bar. The café is best to have snacks and light meals. The pool bar allows guests to enjoy panoramic views while sipping on delicious cocktails. The hotel offers in-room service. Sports, leisure and entertainment facilities are available in abundance within the hotel. Get yourself pampered in the indigo wellness centre, where expert massage therapist help you relax. 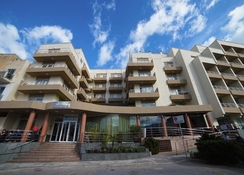 Other facilities in the hotel include sauna, indoor pool, outdoor pool and a fitness room. Hotel with all you need! Stayed her for a week been to many other hotels around this one is value for money no great frills but good as a base and good clean bedrooms, meals etc. having building work done as extending hotel but not n too noisy all in all good hotel. Staff okay some better than others! Perfect position to get out and about..
We came here in March for 3 nights and June for a week. The reception staff are lovely and the room cleaners are fab. We met 1..an English lady called Annette who was so lovely and friendly. We chatted to her a few times. The hotel is spotless. Couldn't fault the cleanliness. Restaurant staff were a bit rude and abrupt on both visits. They go mad and became very annoyed at me for filling my 500ml bottle up with water at the machine at breakfast. REALLY...!!?? Get a grip people!! They were quite happy for me to have 6 glasses of water with my breakfast but went mental over filling a small bottle. Laughable really! Anyway...it's a nice hotel and ...apart from restaurant staff...they are all fab and can't do enough for you. We are hoping to return in October. Food choice at brekky is good. Same everyday but it's all fresh and tasty...and the bread buns are amazing. Hotel nice and clean but evening entertainment was a bit basic. There was a lot of teenagers on school trips which was very annoying as you can amagine. Staff very friendly and helpful.